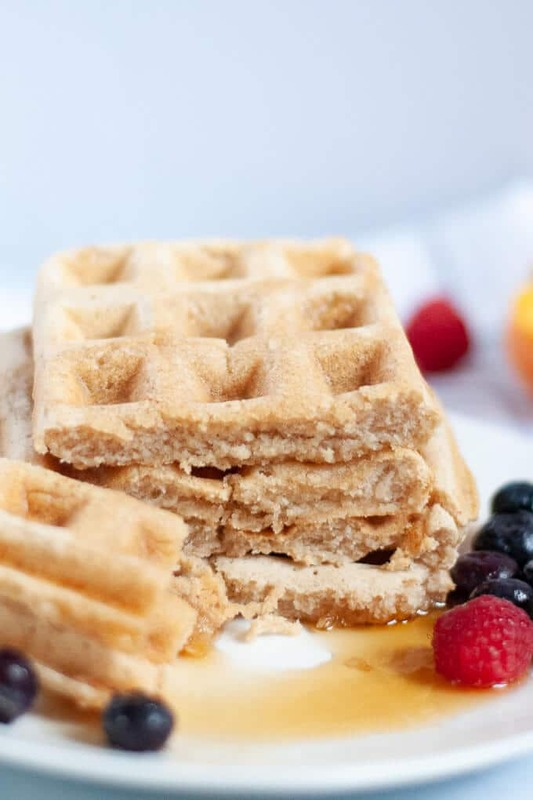 These fluffy vegan waffles are a great reason to roll out of bed on lazy weekends. They’re easy to mix up and perfectly golden! There’s nothing better than a big weekend breakfast. As summer rolls in, I find myself waking up earlier and leaving myself more time for a big breakfast than I do in the winter (thank you sun!!). Saturdays are usually for running around, hiking, and exploring, which calls for a big, filling breakfast. 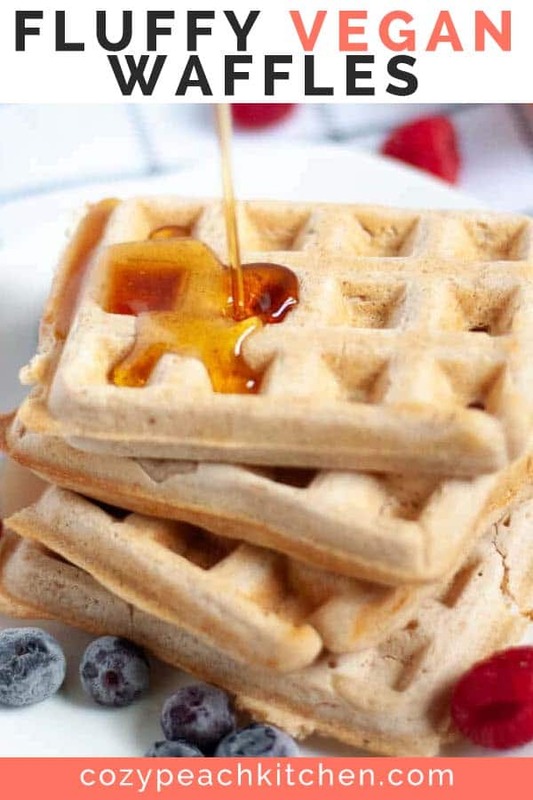 AKA waffles, usually paired with a quick tofu scramble or veggie sausages and a side of fresh fruit. 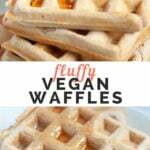 Last Sunday, relishing in my willpower to get out of bed at a decent time, I started experimenting with classic waffle recipes to see how easily I could veganize them. After a few more tries yesterday morning, I got that recipe nailed down! These waffles are fluffy and soft on the inside, with the slightest golden crisp on the outside. 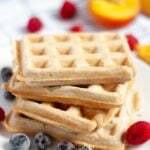 This is a classic waffle recipe, just without the eggs or dairy. 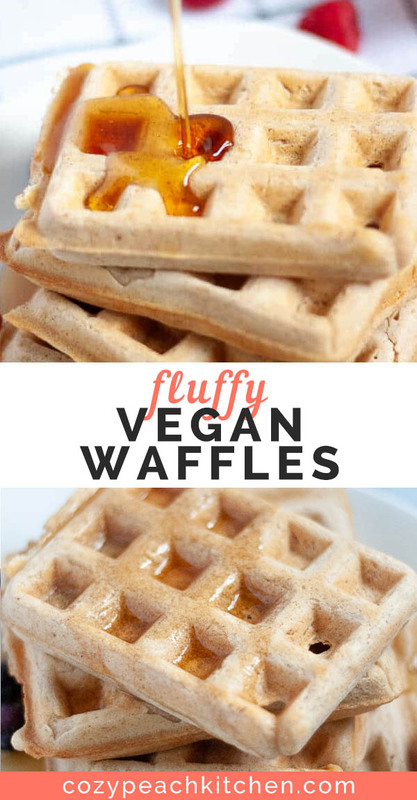 How do you make vegan waffles fluffy? Apple cider vinegar and baking powder work together in this recipe to simulate the leavening properties of an egg. Baking powder is key to making these waffles as fluffy as can be. Baking powder is a combination of baking soda and a weak acid, and it’s integral to baking. For extra oomph (aka fluffiness) I add apple cider vinegar. 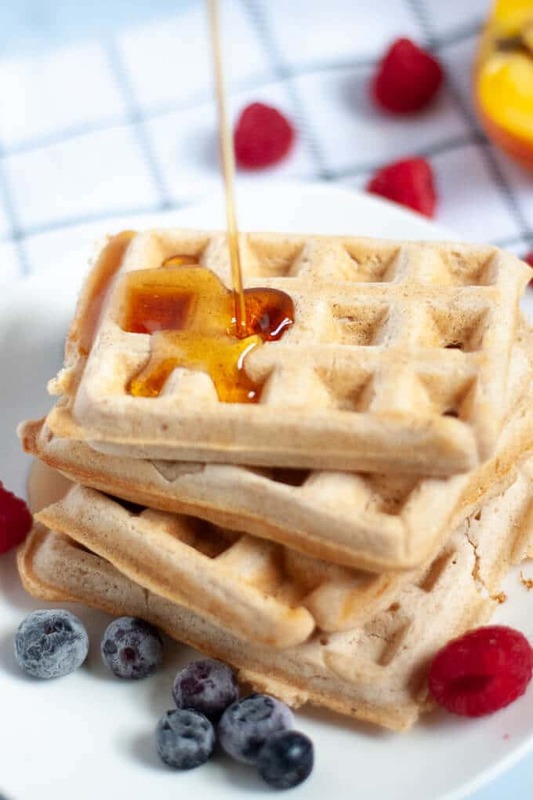 The acids in apple cider vinegar activate the baking powder further, yielding an extra fluffy waffle. Not only does apple cider vinegar help with leavening, it’s lightly sweet and fruity flavor also works well in baked goods. And last but not least: they’re so easy to make! 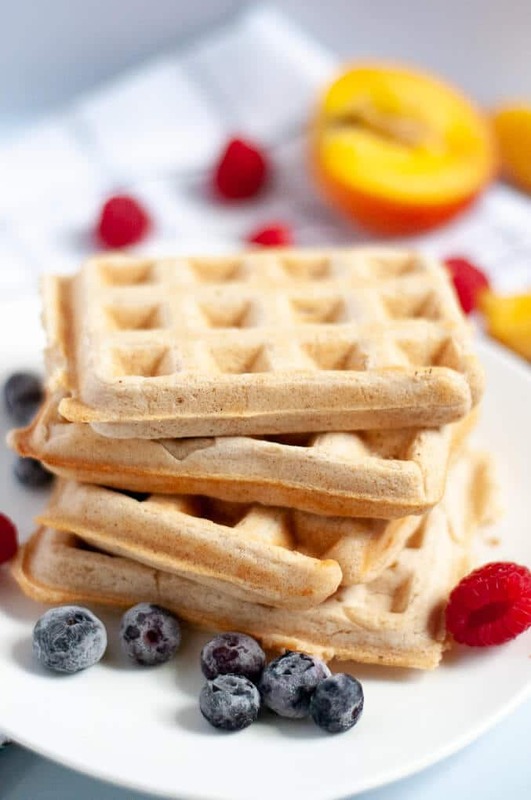 Sprinkle your vegan waffles with extra cinnamon, douse with sweet maple syrup and a side of fresh fruit, and enjoy! Waffle batter should have the consistency of pancake batter – not too thin, but not so thick that it doesn’t spread. It’s okay to leave some lumps in the batter. Make sure your waffle iron is hot before pouring the batter on! It sounds obvious, but it’s always good to double check that the iron is actually heated. Unless you really trust your waffle iron to be non-stick, I recommend spraying it lightly with oil before using. If you don’t have spray oil, you can manually spread vegetable or canola oil on the iron. Don’t open the waffle maker until it stops steaming. Just don’t do it. The waffle may be stuck to the top of the plate, and you don’t want that! Keep waffles warm and crispy in the oven. Turn the oven down to its lowest temperature (usually 200F) and let them hang out in the oven until you’re ready to serve them. If you have any other awesome waffle making tips, leave your thoughts in the comments! I’d love to hear how you make fluffy, crispy waffles. 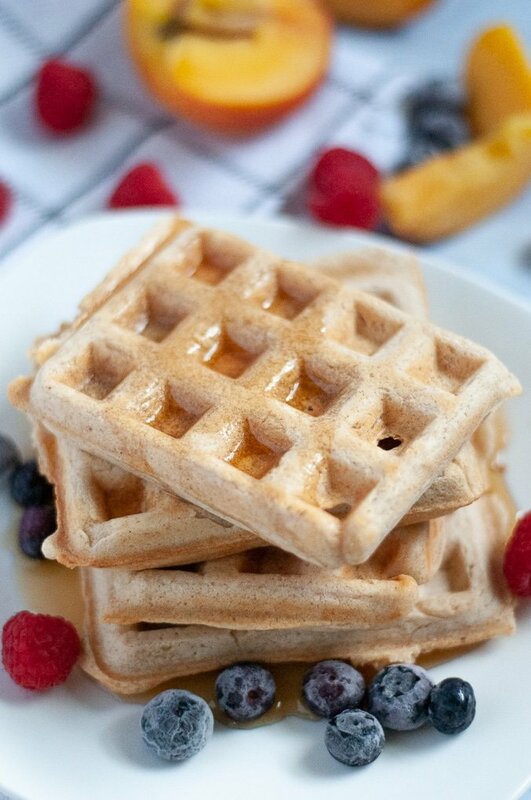 These vegan waffles are fluffy and soft on the inside and crisp and golden on the outside. Pair with fresh fruit or veggie sausage for a filling weekend breakfast. Combine flour, sugar, baking soda, salt, cinnamon, and nutmeg in a medium bowl. Form a well in the center. Pour liquid ingredients into the well. Use a wooden spoon to combine the dry and wet ingredients, mixing until mostly combined. It's okay if a few lumps remain. Cook the waffle batter according to your waffle maker instructions. Top cooked waffles with maple syrup, fresh fruit, and extra cinnamon. Enjoy!